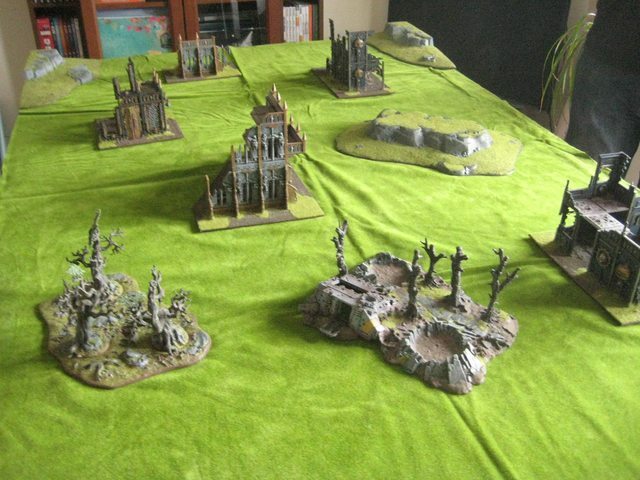 He graciously accepted my challenge, providing a fantastic array of nicely painted scenery (Thanks Keith!) and bugs to fight against. So we rolled for mission type and – appropriately enough – got purge the alien. 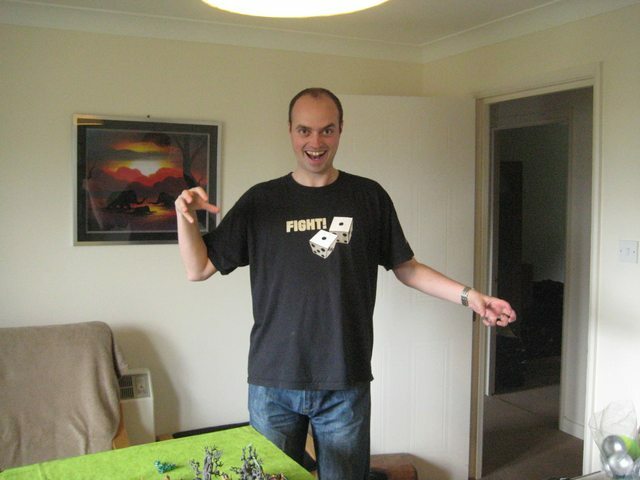 We then rolled for table direction and got hammer & anvil – which suited me, as I knew I could stand back and shoot, while Graham would have to leg it (lots of legs!) the length of the table to get to me! With that in mind, winning the roll off to decide who got to choose deployment, I went second so I could see where he placed the big bugs I knew I would have to deal with early on to have any chance. 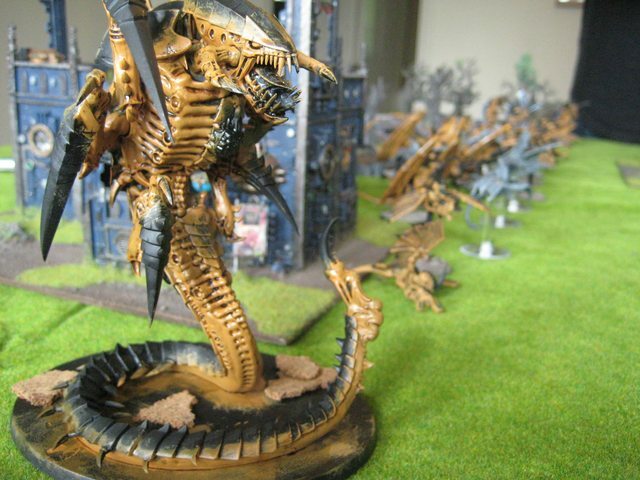 He placed everything along the edge of his deployment zone as expected with the two big bugs (Trygon & Tervigon) to my left – the only exception being his Ymargl Genesteelers kept in reserve. I didn’t know too much about them, so wasn’t too worried, I figured I’d deal with them when the situation arose – how wrong can you be!? 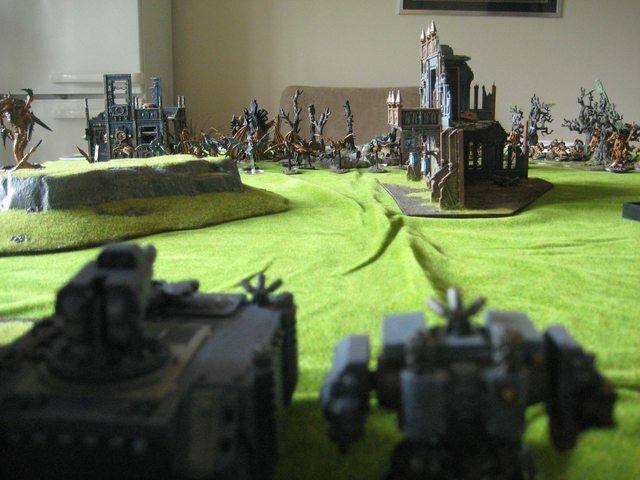 So I castled up in the left corner of my deployment zone, with Vindicators ready to face down the Trygon and Tervigon – let’s see how they like munching on demolisher shells for breakfast! 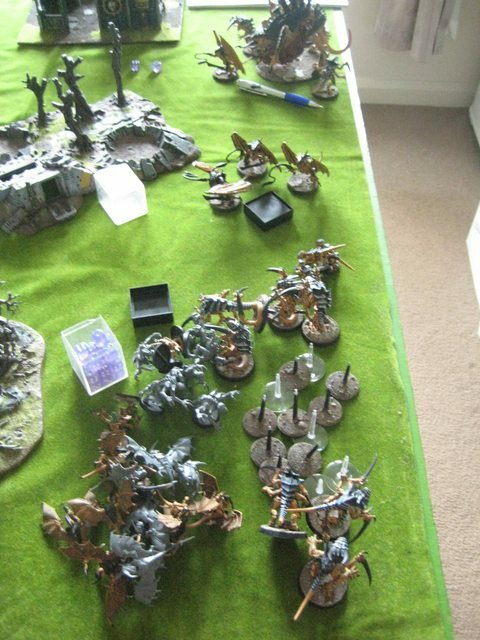 I backed up the Vindi’s with Grey Hunters and Rune Priests. Keeping the Thunderwolves close by, ready to deliver a counterpunch to anything that got too close to my lines. I planned to give my dreadnought a free role to go where he was needed and positioned him fairly central, but close enough to the Vinidicators to force Graham into some tough choices on what to kill first! 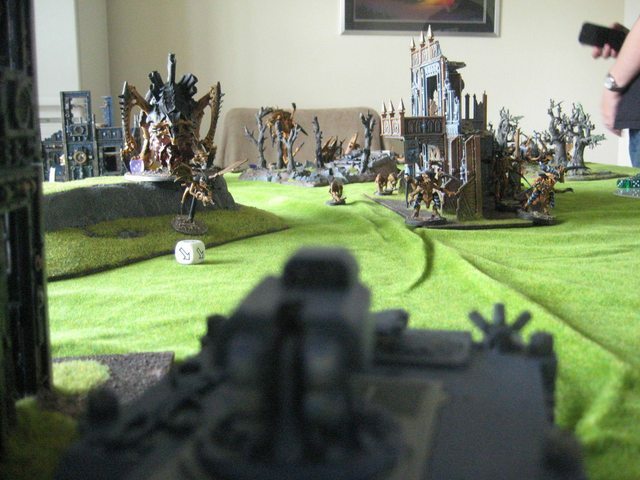 The middle and right of my deployment were covered by the Long Fangs, making use of what seemed to be the best building for line of sight across the table (I should’ve paid more attention to the movement in the shadows, all was not as it seemed!). 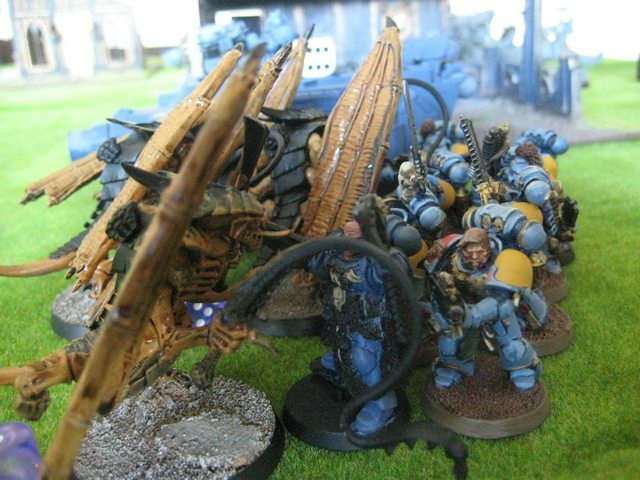 They were covered on the ground by my third squad of Grey Hunters, as I had noticed some unidentified gribbly things (turns out they were Raveners) hanging out on that flank and thought I better keep something over there to hold them back for as long as possible. Not much happened early on as Graham slithered, crawled, leaped and flapped his way up the table. With not much shooting from him and only my Vinidicators and dreadnought really able to get any shots off, casualties were limited on both sides. 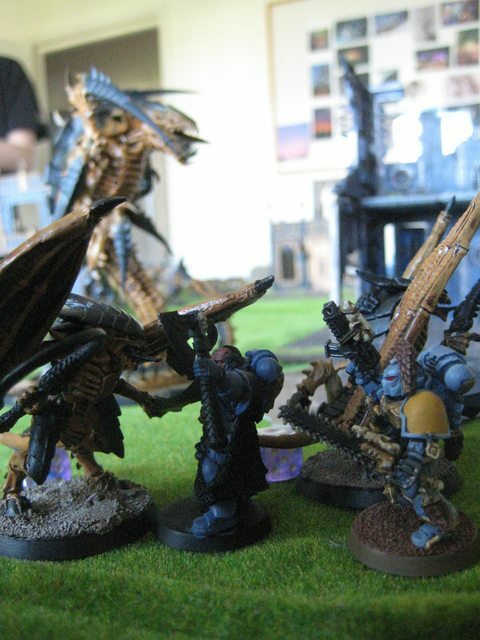 Combat was joined and went mostly as expected – those Tyranids were hungry! Learned some harsh lessons about Shrikes with Lash Whips! 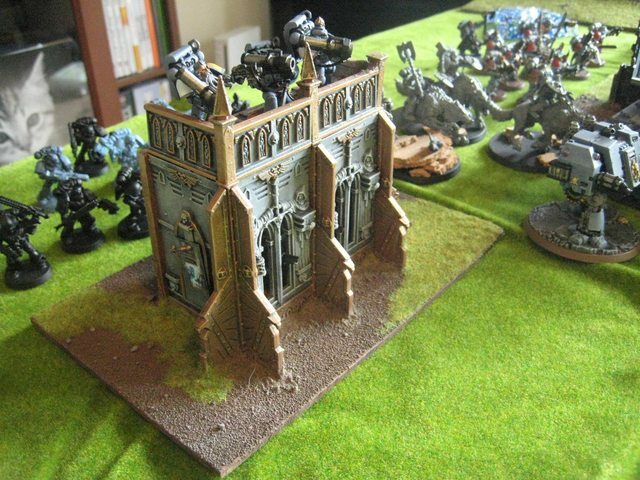 Some good stuff came out of it though: I managed to take out his Raveners before they could do too much damage – I had a feeling they were going to hurt if left to scuttle around unattended! With the rest of his army sneaking up the middle and still a lot of bodies on the board, the signs weren’t looking good for these sons of Russ. With the left flank falling to Shrikes & the Trygon within striking distance – I knew I had to hit back with the Thunderwolves. Thorgrimr Skarfson was also on hand to lend his considerable bulk to the fray and all charged into the evil Serpent. 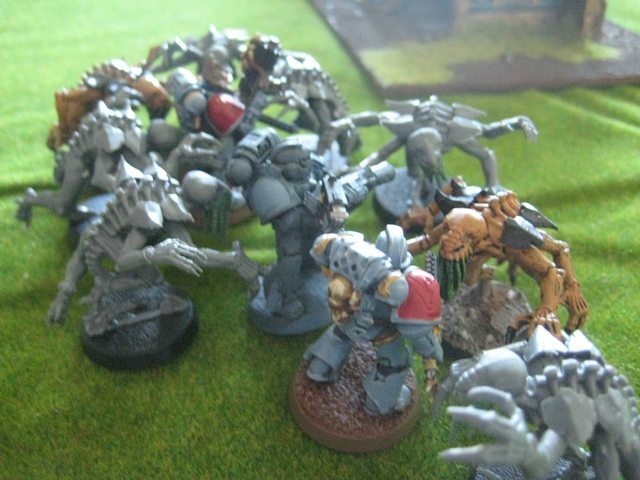 The non-hammer wielding Thunderwolves managed to rend a few wounds on the Trygon as it lashed out at the Dreadnought while they traded blows. 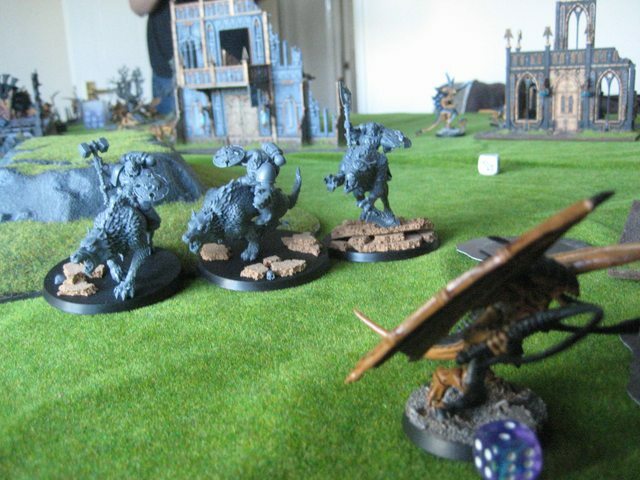 Thorgrimr managed to inflict 3 more wounds, killing the beastie; but not before it could penetrate his armour, killing the Legendary Space Wolf Veteran in a heroic act of self-sacrifice. Saga’s will be told in honour of his deed (at least until he is resurrected for the next battle 😉 ). This left the Thunderhammer wolf rider scratching his beard with nothing to kill! On the right flank, the Genesteelers continued to rip through the last of the Grey Hunters, except for one fearless pack member. 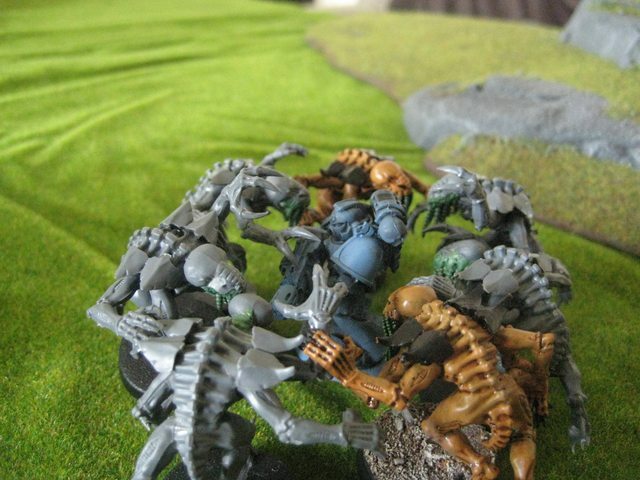 While he was never going to win the combat at least he held up the swarm another turn to protect his brothers. 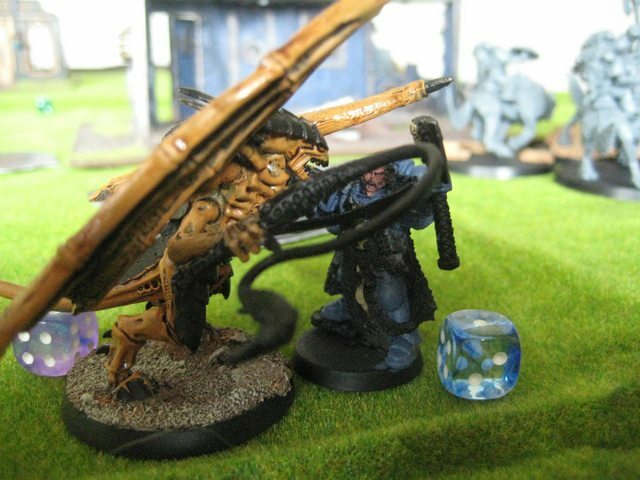 Having tasted Tyranid blood, the Thunderwolves now went after another Monstrous creature – the Tervigon – and tore through it with relative ease. 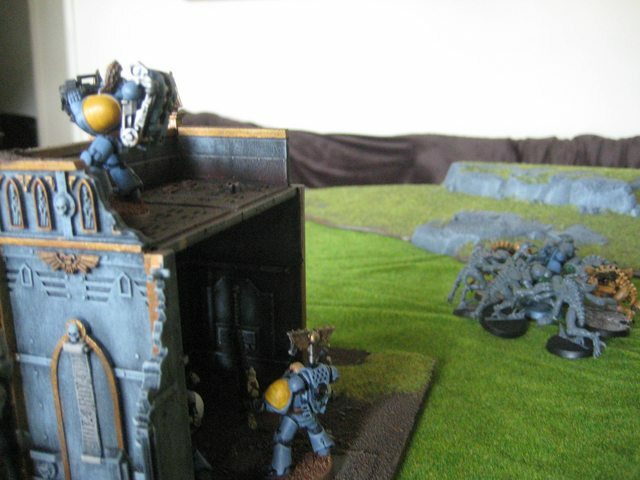 The Vindicator tried to cover their assault by targeting the Tyranid warriors & Prime sneaking up the table through the ruined buildings. Over on the right flank it was all over for the Grey Hunters and now the remnants of the Long Fangs at the hands / claws / tendrils of the Genesteelers. Luckily the Thunderwolves were once again able to pounce and finished them off too! With that Graham announced the end of turn 7 – had it really gone that quick!? What a game! 7 turns flew by and completely different to the usual games we play against MEQ armies & Necrons. 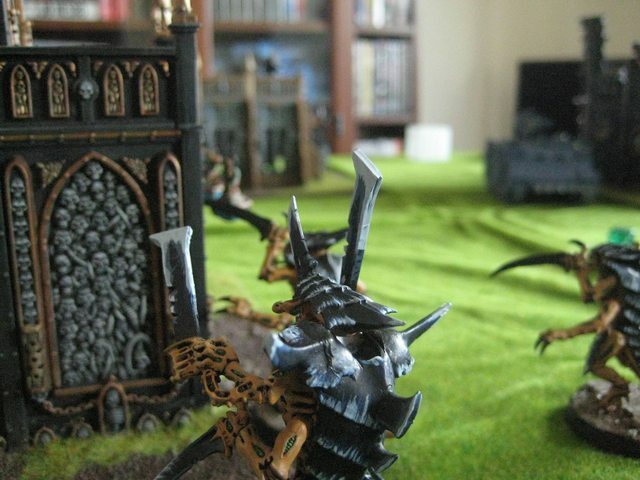 The Tyranids seemed to pose a threat from all angles, at all times and move unfeasibly quickly. If it had not been for the table orientation I think Graham could’ve wiped me out a lot sooner. I was lucky to be able to huddle in one corner of the field and avoid most of his force for as long as possible, while concentrating my attacks against his high value targets. At points it looked like it was going to end horribly, then at others the balance seemed to swing back in my favour. Talking with Graham after the game, he suggested that I should’ve made better use of my Grey Hunters by screening the heavy stuff. 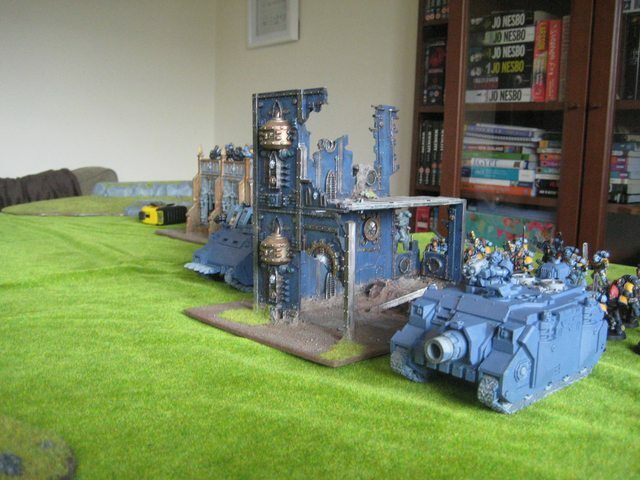 That way they could make use of their 24 bolter shots, 4 plasma guns, 2 meltas and Rune Priests ranged attacks – which is what Graham was really scared of with most of his stuff having 5+ armour saves. 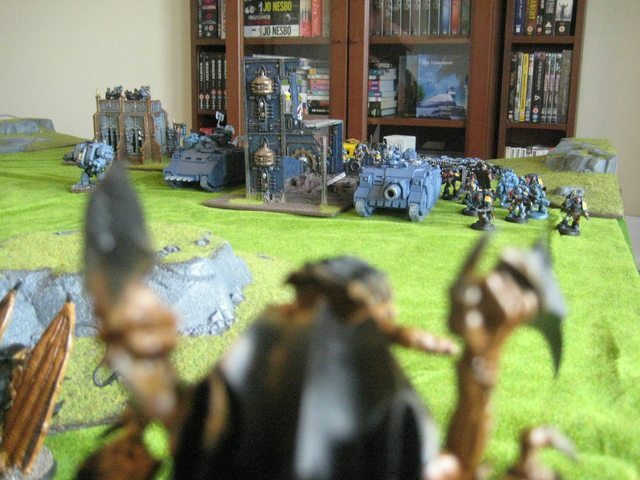 Instead I held them back to protect the backfield, which was a bit daft as there were no objectives to grab at the end of the game and just meant they got drawn into close combat – one place you don’t want to be against Tyranids! All in all, great fun and as usual lots learned – mainly: giant cybernetic wolves are almost as hungry as oversized bugs! Can’t wait for the rematch – maybe against a ‘greener’ army! It was indeed a fun game with the classic situation of bullets and beams flying, bugs dying and then they get to eat stuff. Hadn’t realised thunderwolves were that mean and first death of the trygon so kudos to you. Rematch will be very much looked forward to.